A combination of vintage silhouettes and porcelain doll inspiration, De-mes'Tiks NYC takes African Chic to the next level with the distinct feeling of sophistication, polish, and glamour. The designer behind the line, Rueben Reuel, not only commits himself to producing beautiful garments for all sizes, but also is committed to producing his line through the use of NYC garment district in hopes of preserving this historic place. This line offers a full range of sizes from size small up to a 3x. Price ranges is $150 - $200. I am in love with the Naomi blouse. What's your favorite piece? This week save 15% off these designs by using the code RRR85. Oh and don't forget to enter the giveaway on the next post. The winner will be announced Friday. Ahhh!! The Minnie Bell is so fantastic! I Have to have it!! Must!! Oh I love these pieces! 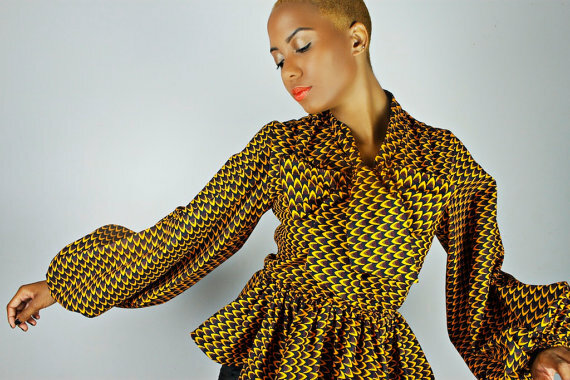 The Naomi blouse is the bizness!!!!!!!!!!!!!! Great styling. I found a lot of cool clothes online store http://heppin.com/. Are any of you familiar with this website?